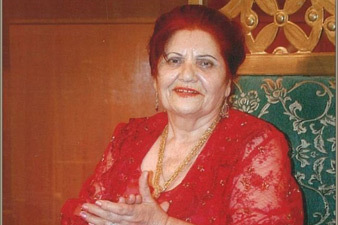 Armenian poetess, writer and translator Metakse died on August 10, at the age of 88. By a decision of Armenia’s Prime Minister, a government commission will be set up to organize the funeral of the poetess, Culture Ministry said. Metakse or Metakse Poghosian (born 1926, Artik) was an Armenian poetess, writer, translator and public activist. She was a member of the Advisory Board of the Writers Union of Armenia. She is the author of many popular books including poem collections ("Youth," "Female Heart," "A Conversation with the World"). In 2006, she published "The Woman of the Fate" book of her selected works. Her poetry has been translated into English, French, Japanese, Bulgarian, Serbian, Spanish and other languages by Bella Akhmadulina, Desanka Maksimović, Diana Der Hovanessian and others. After Spitak earthquake of 1988, she became the vice-president of "Motherhood" benevolent fund, supported female members of Armenian Army during the Karabakh War, was in battlefields of Karabakh.